Are you looking for Gluten Free Raspberry Recipes? Many people LOVE RASPBERRIES, but they cannot choose just any one of the many berry recipes available to make a delectable treat, without first modifying it to ensure it is "gluten-free". These people cannot tolerate gluten in their diet. Perhaps they suffer from celiac disease, or another condition which prevents them from including gluten in their diet. In very general terms, a gluten-free diet is a diet completely free of ingredients derived from gluten-containing cereals: wheat, barley, rye, malts, triticale, and sometimes oats. Here are yummy recipes to prepare that the whole family will enjoy! No one will even guess they are gluten-free! In fact, when you serve and prepare these delicious recipes, those who do not require a diet free of gluten, will want second servings too! Note - There are also many more recipes included in the over 400 recipes on this website which would be considered "gluten-free". The list above are recipes which are specifically created with a wheat-free diet in mind. Use the navigation buttons on the left hand column (or scroll down for mobile view) to find more recipes that you may wish to use (perhaps you will want to modify some raspberry recipes as well). Be sure to check out the colourful raspberry salads and the scrumptiously scrumptious smoothie recipes too ... many of them are gluten free as well, or can be easily adapted to make them so! I am certainly not an authority on the health issues surrounding Celiac Disease and other conditions, nor am I an authority on all the issues of a gluten free diet. 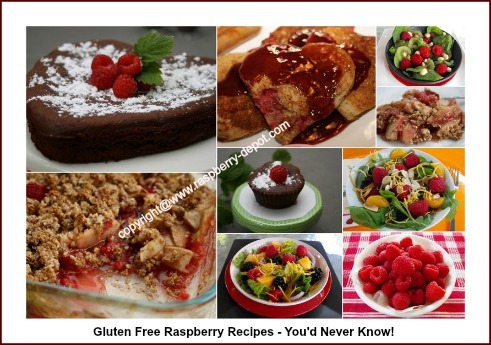 What I do know is that those who cannot tolerate gluten, or have family members who cannot, and LOVE RASPBERRIES can still use them in their diet by following special recipes created free from any gluten that taste amazing! I recently purchased a book entitled: "You Won't Believe It's Gluten-Free! : 500 Delicious, Foolproof Recipes for Healthy Living" - and I am delighted with it! I heartily recommend this great resource! It's available for purchase online at *Amazon.com ... click on the image below for more detailed product information and customer reviews.